We’ve got some really exciting news we’ve been waiting to share with you and now we finally can…. *drumroll please*…..for the second year running we are supporting….. This year is set to be bigger and better than last year and we have lots of fantastic activities planned for our stores nationwide. Our totals were amazing last year and we can’t wait to smash them in 2014. We’d like to say a big thank you to everyone who contributed to our total of £162,412.56 last year. It still amazes us and just thinking about what we could achieve this year is a challenge we’re all geared up for! We can absolutely guarantee this year is going to be even more amazing, as we have lots of tricks up our sleeves to make it extra special. We’ll also be keeping you updated throughout our fundraising journey, so make sure you keep an eye out for our blog posts and social mentions. 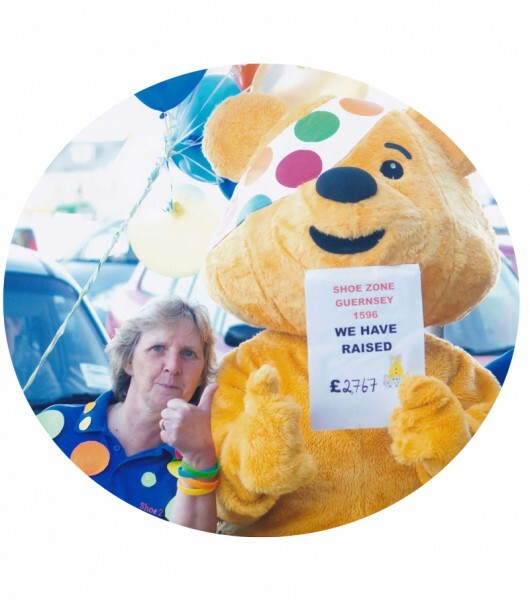 We hope you’ll agree what an inspirational charity BBC Children in Need is and that you too will get involved with raising money for the thousands of disadvantaged children and young people across the UK that need our help. Just reporting on a fabulous morning I spent with Juliet from BBC Children in Need who took the time to explain how lucky Guernsey has been to secure funding for two charities on the island. The first is ‘Safer’ who provide support, advice and activities to children who have witnessed or been part of domestic abuse. The work this organisation does means these children will now have better family relationships and the confidence to speak out and express their emotions. The second is ‘Drug Concern’ who work with young people whose home life is affected by drugs and alcohol. They provide family counselling to hopefully help them make positive life choices and keep away from addiction. I learnt that this isn’t true and we don’t see what happens behind closed doors. I had to concentrate on the bigger picture, take off my blinkers and began to see. Everywhere has problems! Children are in need from all walks of life and not just those from poor families. I felt angry, I felt sad, but I also felt happy that these children are being helped. I now know that however much we raise for BBC Children in Need, it will never be enough to take away the cruelty and sadness that some children will have to endure. But every penny raised will at least give these children a chance. Let’s make it BIG and let’s make it count. Forget last year’s £100 per store target, try £1000. I know we can do it!! I am challenging you all to take the top spot from us here at Guernsey. Good luck all, see you at the finishing line. So we have raised £2,000 is there any stores going to beat us?